Modules are wonderfully flexible language constructs which can be applied to a wide variety of use cases, such as namespacing, inheritance, and decorating. However, some developers are still confused about how modules work and how they interact with their own code. This article aims to shed some light on Modules and their usage. The class-objects our class is derived from live above our class. The class-objects deriving from our class live below it. To the right of our class, lives its eigenclass (a.k.a singleton class or meta-class). Eigenclasses are class-objects, too, and as such, they have superclasses, usually the eigenclass of our class’s superclass or, in the case of instance objects, the class of the object itself. A full description of eigenclasses is beyond the scope of this article and deserves an article in itself. For now, don’t worry too much about them, just know that they are there and that they have a purpose. So, what happens when we instantiate an object based on our class? 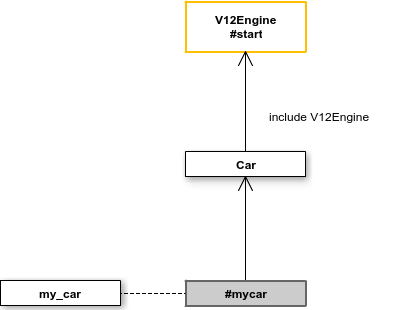 Ruby will create our object’s eigenclass directly under our Car class. 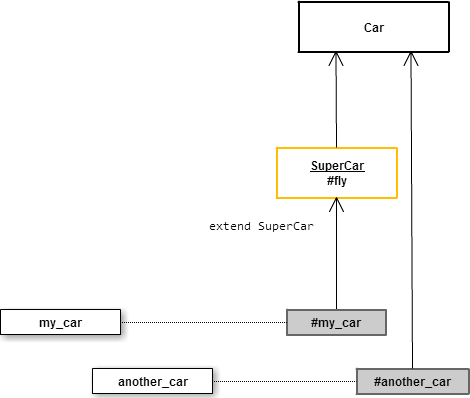 It will place our new instance (my_car) to the left of its eigenclass and outside the object hierarchy. Let’s call a method on our object? 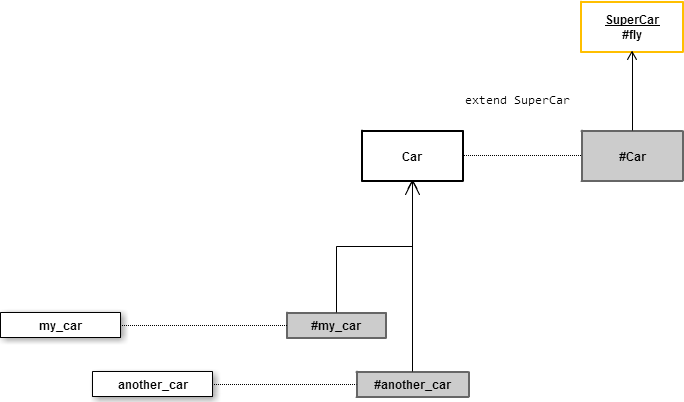 When we call the drive method on my_car, Ruby will first look to the right in my_car‘s eigenclass object. It won’t find the method definition there, so it will look up to the Car objects, where it will find the definition of drive. Knowing this makes understanding how to use modules easy. Including a module in our object will place it directly above our object. Prepending a module to our object will place it directly below our object. Extending our object with a module will place it directly above our object’s eigenclass. NOTE: Calling the superclass method on a class object will give us the next higher class in the ancestor chain above our class. 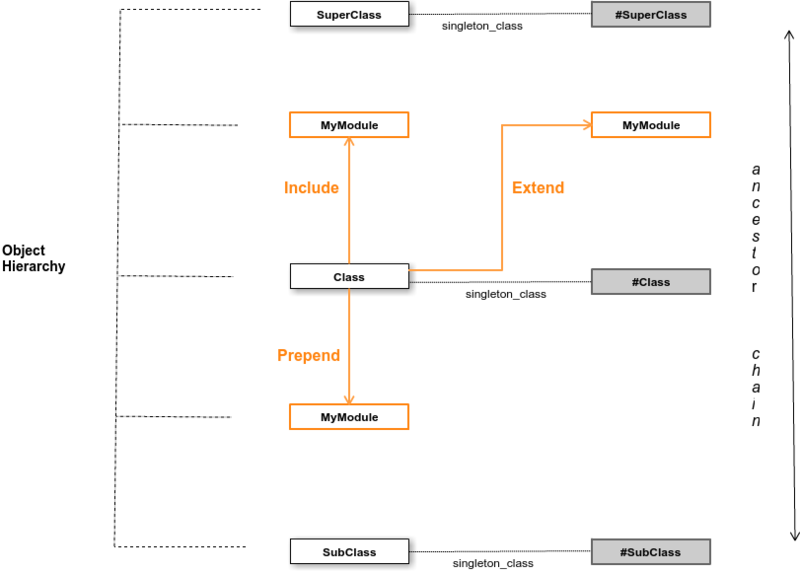 However, as Modules aren’t technically Classes, superclass won’t show us any modules directly above our class. For that, we need to use the ancestors method. This is the usual way to implement multiple inheritance in Ruby, as we can include many modules in our class, thereby giving it a lot of extra functionality. Modules used to that effect are known as “mixins”. Note: It also means that if we define a method with the same name in our Car class, Ruby will find and run this instead and our Module method will never be called. 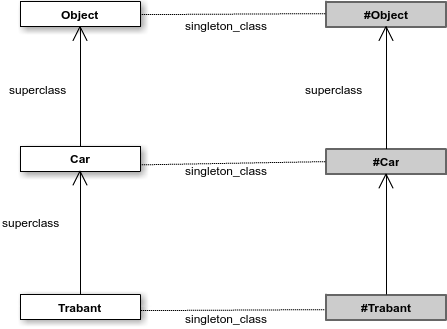 As instance objects are placed outside the ROM hierarchy, there is no ‘above’ or ‘below’ them where we can place modules (see the Method Lookup diagram). 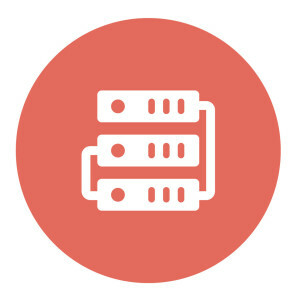 This means that we cannot include or prepend modules to instance objects. But what if we call the method on our class object instead? Our receiver object is now the Car class itself. Ruby will first look to the right (Car) and then up to SuperCar module where, lo and behold, it will find the fly method. So, extending a Class with a Module, effectively gives our Class new class methods. This will place the SuperCar module above our object’s eigen-class. There’s much more to Modules than can be covered in a single article. Understanding how Modules fit into the Ruby Object Model is essential in order to use them fully and creatively. Let us know how Modules fit into your designs and all the cool things you do with them!